For those of us that work solo and generally have no assistant, it’s always difficult to move around town with a lot of gear. I’ve tried pull carts, backpacks, roller bags… all work fine but still somewhat limited in my opinion and heavy. I went on Craig’s List and found this Jogging Stroller for $40. It’s actually in great condition. I did have to replace one inner tube on one of the back tires, but other than that, it’s in fine shape. I went to Home Depot and found this down spout for $6 and tie wrapped it into the cart. I’ll look for something more permanent over the holiday’s when I have more time. But, the concept seems to work just fine. I have my lightstand with Profoto B1 and a 2 x 3 softbox attached. 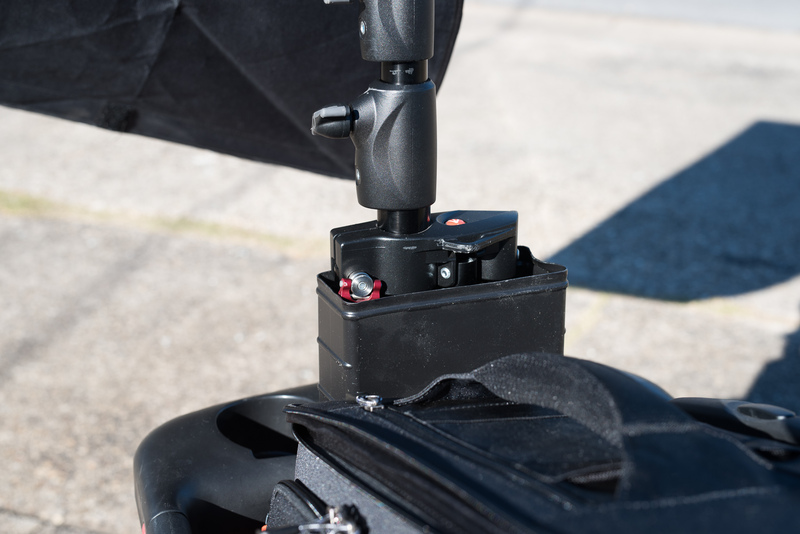 I simply slip the lightstand into the down spout…uh, I mean Lightstand Holder J and the cart moves with little effort. My full camera bag sits where the baby used to sit. I now can carry all my prime lenses, and strobe plus a sandbag should I need to anchor my lightstand when it’s off the cart. Also, I can extend the lightstand and use it in place if I’m on solid ground. 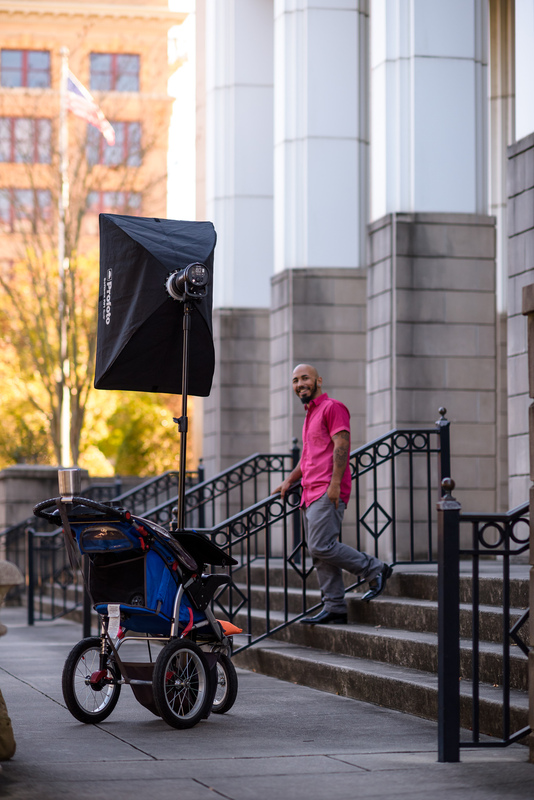 Just set the brake on the jogging stoller, extend the lightstand to the height I need, and I’m off. Lower back down when I’m done with that location. If I need to take the lightstand out of the sheath, simply lift it out of its sheath and set it up like I normally do. So, what you do think? I hope to use this for the first time tomorrow. I’ll let you know if I encounter any unforeseen issues. Besides the fact I am wicked envious you have a Profoto B1, this is really something! 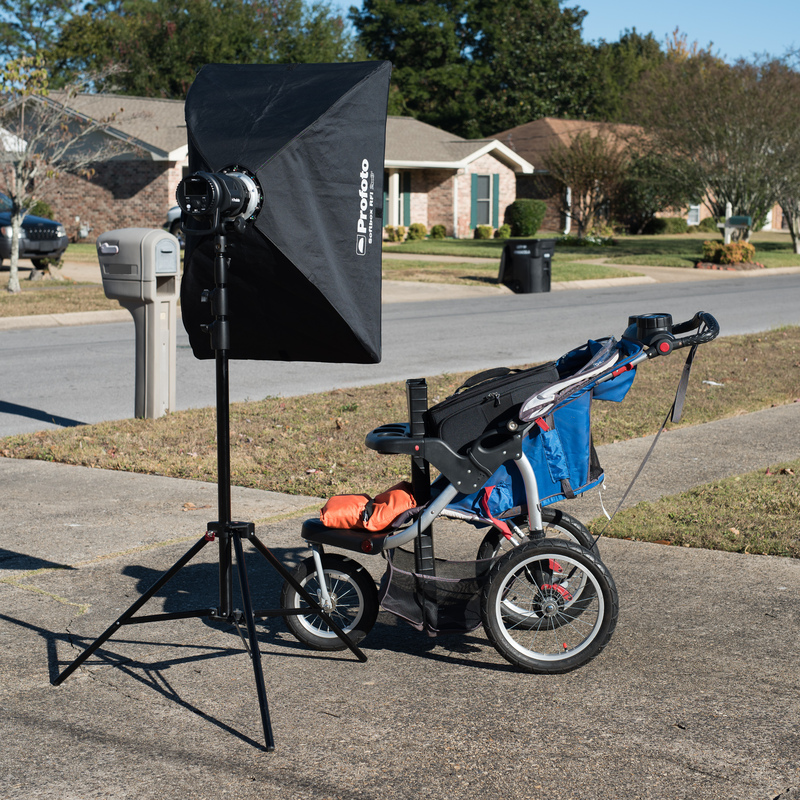 What happens to the "lightstand holder" when you have to fold up the cart and put it in the car? Thanks Neil! I'm looking forward to using this tomorrow on a portrait shoot. Thanks druno. The cart actually still folds. I just lift the "lightstand holder" up, as it's not tightly secured, then collapse the cart. I am still in the discovery phase. My next revision will be to have a hinged section so I don't have to move the holder. That is an interesting idea. 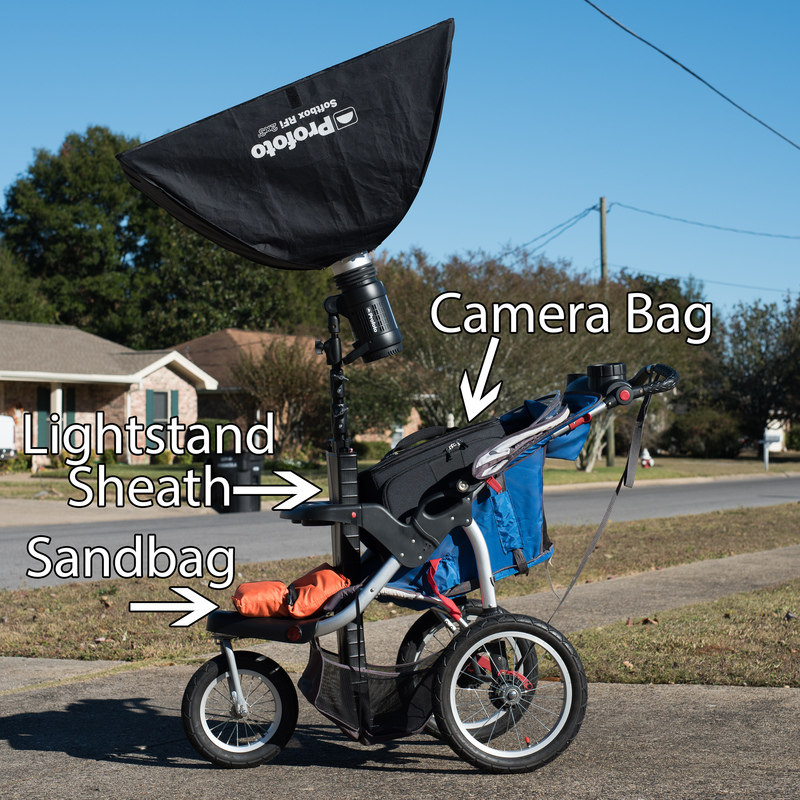 I was thinking an old golf buggy, but that does not give the area for a large camera bag, it would be awkward to strap to it, but this idea, yep. You'd have to pick your battles though if windy with such a large softbox attached and wheeling it around, you would end up in my backyard in Oz scaring the kangaroos. 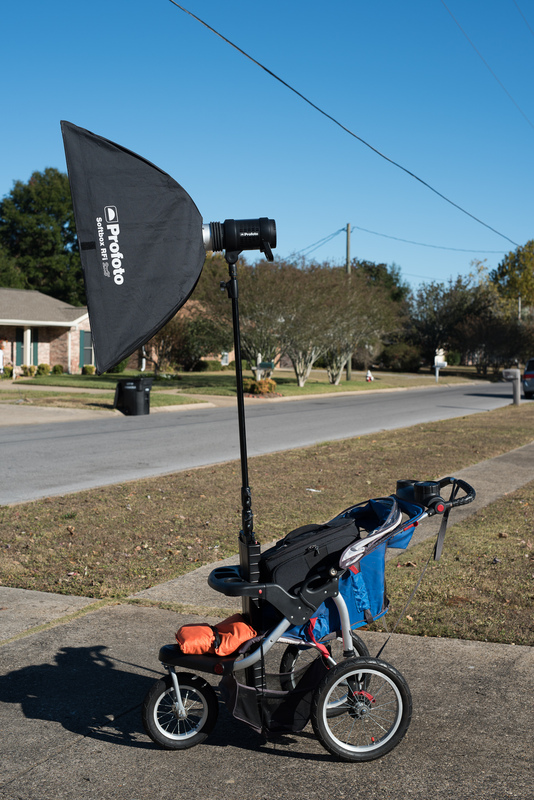 Another thing, it would be so so easy to position the softbox on subject without having to lift the stand and placing down again, if using in trolley's 'sheath' just a quick movement of the stroller to position to the perfect spot and away you go, top idea if by oneself. Trev.. thank you sir. If that wind blew me over your way, we could finally have share a meal and a beer together!! Well, I'm gonna give this a try tomorrow and see how it goes. I hope to use it on the cart as much as possible without having to take it off. The less I have to lift it, the longer in the day I can go... I ain't gettin' any younger! Dave, your original post, I bet you copied and pasted from another post somewhere, I too get those 'odd' breaks in the lines even though it looks right if I copy some text from anywhere on the web. I checked Facebook and saw you initially must have posted in there, but copied that for this thread. I fixed it so it's a bit easier to read, hope you don't mind. If you copy some text, open Notepad, paste into there, paragraph it like you want, then copy *that* again and post in the comment box and it's as you saw it in Notepad. hmmm.... just noticed Dave in your post on Tangents Facebook someone else mentioned a golf buggy, but I do think your option would be the way to go. Also ain't getting any younger, and my camera bag alone weighs around 12kg (26.5lbs) ouch. Luckily it's a 'roller' type, but hard yakka in sand, long grass. Thanks Trev for fixing my paragraphs!! I'll try Notepad next go around. I recently purchased the Think Tank Airport Navigator (seen in picture) and love it. Inside, I have a D810 and four primes, Sigma 35 f/1.4 ART, Sigma 50 f/1.4 ART, Nikon 85 f/1.4 and Nikon 105 f/1.4 and then a few other miscellaneous items like a cleaning kit and my hoodman eyeloupe. I'm guessing all together, the bag weighs about 20 lbs (~9.1kg). So, not too bad and it rolls. But the lightstand, with B1 and softbox weighs around 10 lbs or so and is very bulky. A lot to lug around for a couple of hours! So, I'm hoping the cart will be a back saver for me. One quick update... just got back from a shoot downtown. The cart worked flawlessly. I covered twice the ground I would have covered had I been carrying all of my equipment. This gives me more backgrounds to work with enabling me to have more options with my images. I do need to secure everything a bit more permanent as the zip ties are temporarily holding things in place but there was some wobble... which can be easily corrected if I just purchase a more sturdy anchoring system for my lightstand holder. Here's a quick picture of my setup with the model. Looking good Dave, the setup that is, the model's not my type and glad it worked great for you. Definitely something I will have to look into myself. Love it. Do you have a Patent on it yet Dave. hah! Nice one getting published on DIY photo. I assume you were in touch with Udi? He's a nice guy. lol Trev... nope. Not much to patent really. Thanks Neil... I was contacted by John Aldred, a writer for DIY.